With the ongoing water crisis in Cape Town, finding the correct skincare that will protect the skin against the harsh environment is important. Remember that water is the source of hydration and hydrated skin is less susceptible to sun damage, therefore it is vital that we choose products that are natural and provide the skin with optimal care. So why not choose products that are made in our own country, where often careful considerations of climate change were made in the manufacturing? How does a skincare range rich in antioxidants, natural power and bio-active ingredients which will repair, nourish and protect the skin sound to you? And it was made right here in the good old RSA. African Extracts Rooibos is one of South Africa’s top-selling beauty brands. Their products are inspired by nature. The main ingredient is of course the effective plant grown right here in Cape Town, the famous Rooibos extract. This extract is completely organic and has been cultivated without any chemical fertilizers or insecticides. Rooibos is rich in minerals and antioxidants, including aspalathin and nothofagin, which act against free radicals. It is best known for its anti-inflammatory properties and its remarkable healing powers. The classic range is ideal to start off with, as they are gentle to use and will not cause any irritation to the skin. Start by using the soothing cleansing lotion, which is light and non-greasy. It contains green Rooibos, chamomile and vitamin, which will help soothe and restore moisture while cleansing effectively, leaving the skin clean and moisturized. Follow with the refreshing alcohol-free toner, which contains witch hazel extracts to gently soothe and refresh the skin. For very dry and tight skin, decant the toner into a spray bottle and use as a refreshing facial mist throughout the day. The classic day cream is a delicate creamy formula which contains high extracts of Rooibos and Vitamin E that work together to prevent cell damage. With the addition of SPF15 sunscreen, it helps protect against premature aging and skin discolouration. This powerful non-allergenic cream is easily absorbed and is suitable for all types of skin. The night cream is carefully blended with chamomile, Vitamina A and E. This soft cream penetrates the skin to work with the skin’s natural cell renewal process that restores, rehydrates and regenerates the skin while you sleep. 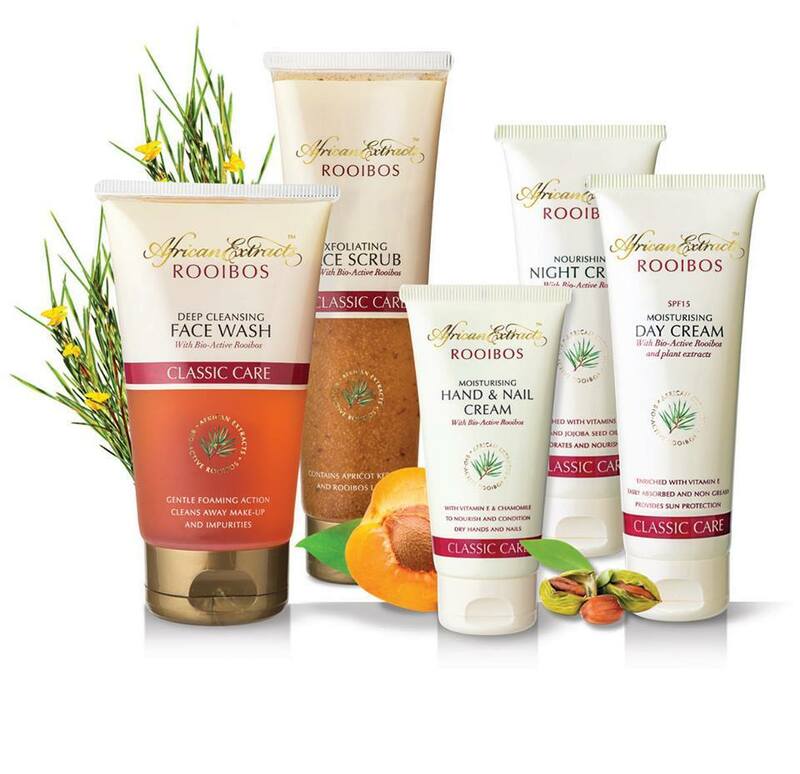 This classic Rooibos skincare range is ideal for anyone with concerns of dryness, sensitivity and sun damage. All Rooibos products are inspired by nature and are not tested on animals and are paraben free. After celebrating 15 years in the skincare industry, it is no wonder that Rooibos is one of the top selling beauty brands.